This course is intended for prospective mathematics majors who want to learn at an early stage topics in mathematics outside of the standard calculus courses. This term, the course is designed to introduce students to the beautiful subject of bijective and enumerative combinatorics. This is a subject which requires little mathematical background to reach the frontiers of current research. 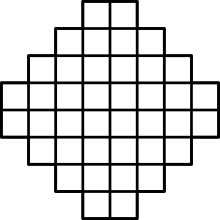 using vertical and horizontal dominoes is 210; and the number of polyominoes of area 4 (the pieces in the Tetris game), up to rotations and reflections, is 5. No formula is known, however, for the number of polyominoes of area n, where n is an arbitrary positive integer. Many similar problems are unsolved as well, despite being easy to state. We will be concerned primarily with bijective proofs, that is, showing that two sets have the same number of elements by exhibiting a bijection (one-to-one correspondence) between them. No textbook required for this course. The material will be based on notes and handouts, usually following the list of Bijective proof problems by Richard Stanley. A. T. Benjamin and J. J. Quinn, Proofs That Really Count: The Art of Combinatorial Proof, Dolciani Mathematical Expositions, Mathematical Association of America, 2003. N. Loehr, Bijective Combinatorics, CRC Press. D. Stanton and D. White, Constructive Combinatorics, Undergraduate Text in Mathematics, Springer. There will be no exams for this course. The course grade will be based on the written homework (50%), the homework solutions presented in class (20%), and an oral presentation (30%). Homework will be assigned on most days. Written homework will be collected weekly. No late homework will be accepted unless arranged with the intructor in advance and for a very legitimate reason.